Cheating is probably not the best way to pass a test, but for the not-so-intelligent Tom, it’s the only way to get higher grades. And it’s you who can help him peek into his classmates’ notes without being caught by his teacher. Genius School is home to super bright students, but it also hides a secret. 1. To get a grade quickly, you will have to cheat. Tap and hold a student and the meter at the top of the screen fills up until it reaches a target grade. Hold a student until the green smiley icon above him fills completely. 2. You will have to cheat quickly and reach your target grade before the timer at the upper-left corner of the screen hits zero. But watch out for your teacher’s angry gaze and don’t get caught cheating. Tom’s busted if he comes under his line of sight. 3. Look for the exclamation mark above the teacher and try not to take the risk of moving around when he sets his gaze all around the room. The exclamation mark will blink twice or thrice before the beam activates. Stay at your seat and you will be safe from his laser gaze. 4. Quickly tap and hold a student to cheat when the teacher finishes scanning the entire classroom. To save time, try cheating when the beam moves past Tom’s seat. You can tap a student seated on the opposite side of his beam when it moves past Tom. 5. Keep an eye on his gaze pattern. It might not be the same as the previous level. In one level, the beam moves from left to right or vice-versa, whereas in other level, the beam is straight and widens to cover all students. Many times the pattern will change in the same level. 6. You can cheat from a student more than once. Stop cheating when there’s a stop icon above him/her. You will earn coins when the grade meter hits “A”. 7. On some levels, you will get power-ups that appear on the classroom. Tap the power-up to grab it and use it to cheat and get grades faster. Unlocked power-ups appear randomly in a classroom. You can also upgrade your power-ups at the “Shop”, which can be found on the level map screen. 8. There are some really cool power-ups such as invisibility that allows you to stay gaze-proof for a few seconds. Keep an eye on “special boosters” on a level. Such boosters appear on the right side of the screen. You can activate a booster by tapping it. “Helping Friend” is one such booster that lets you call your bestie, who will keep him busy while you cheat your heart out. While cheating, you may have noticed that smiley above a student changing color – from green to yellow and then finally red. Well, these smileys simply suggest that your fellow students don’t like the way you are taking help from them. An angry red smiley means danger and you should quickly take your seat or go cheat elsewhere. When the smiley turns red, the student will immediately alert the examiner and you might be caught. One of the best ways to get better grades is to use power-ups and boosters. Try to use boosters such as the Helping Friend to divert your teacher’s attention. 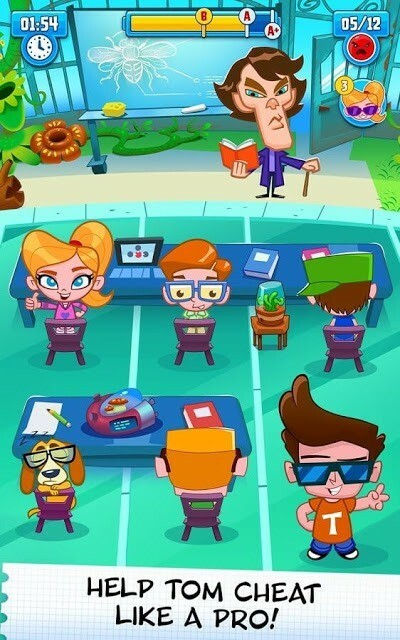 Using boosters and power-ups, you will be able to cheat effortlessly without alarming your teacher as long as they are activated. You will be able to cheat more often without worrying about that nightmarish beam from your teacher. You can quickly reach your target, and can even secure A+. At the start of play, you can use 3, but as you progress, you will get free power-ups after watching a short video clip. If you are busted or the timer hits zero, and you are just a few steps away from getting an A+ or completing the primary objective, you can still continue by watching a video. This will give you fifteen extra seconds. Keep in mind that there is a limit to such offers, so try to use extra time only for hard-to-beat levels. You start earning coins when you get an A grade. Try to get three stars in every level to earn more coins and spend them to improve your power-ups. You can boost unlocked power-ups, but I am sure you have your personal favorites. Mine? Well, I prefer upgrading Time Freeze and Invisibility over others, but if I have more coins, I try to upgrade most of the power-ups because you never know which of them appears randomly in the classroom. Upgrade your boosters and then play older levels again to get some extra coins. This way you can earn more money and save them for costumes. Since your power-ups have been upgraded it will be very easy for you to complete older levels. While the coins earned in a replayed level might be less than the coins you have earned for the first time, still there’s no harm in entering the same classroom again if you are getting a few bucks with little effort. In most games, linking to Facebook has its own perks. In Cheating Tom 3, linking your game to your FB account will grant a free costume. This special costume will give a coins boost and you will earn more coins. The Facebook offer will appear on the screen and all you will have to do is accept it to get a big coins boost. Look for students that give a grade boost. Such super intelligent students move around from one seat to another after you finish cheating from them. Costumes not only look cool on Tom, but also provide certain boosts that will help you in the classroom. While they are pretty pricey, they can be of immense help. For example: The Tomb Raider costume provides bonus seconds to power-ups, whereas the Egyp’Tom costume gives a seconds boost to the invisibility power-up. A good idea would be to upgrade powers-ups first. You can later save money for costumes once you have boosted them.